U.S. Senator Tom Carper visits the beach replenishment at Bethany Beach. After several weeks of pumping sand from offshore borrow sites, the Great Lake Dock & Dredge Company was set to continue south to replenish South Bethany’s shoreline on July 5, just slightly behind schedule, with an estimated completion date of July 29. 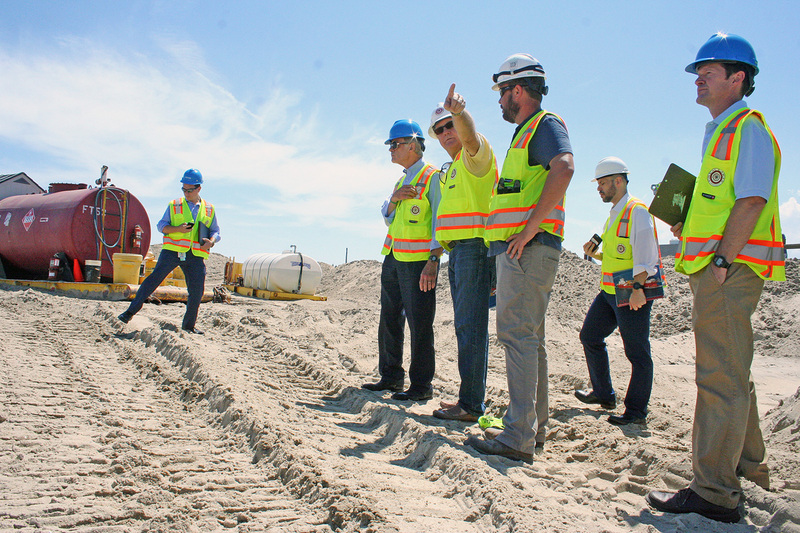 U.S. Sen. Tom Carper visited the moving construction site on June 29, one of the final days of the Bethany Beach leg of the project, which this week saw the start of dune crossing and dune fencing restoration. As has been the case in Bethany, the beach in South Bethany will have continuous, but rolling, closures of up to 1,000 feet at a time as the beach and dunes are re-sculpted. The public may not enter the beach or swim in the construction zones. Delaware’s project is an average-sized project, said Bryan Dast, project manager for Great Lakes. Every project is challenging, but the nearby crowds are a unique piece of the puzzle, Dast said. Although he enjoys curious passers-by asking questions, he emphasized that he also needs them to keep off this active construction site. “Always stay clear of it. It is an active construction zone. Lots of heavy equipment,” said Dast. The project involves dredging 1.2 million cubic yards of sand from borrow sites several miles offshore. Unfortunately for this year’s renourishment, the underwater sand stores don’t seem to be replenishing themselves, staff said. In fact, Bethany’s site was exhausted early, so they were already pulling from Fenwick’s borrow site. The sand is loosely filtered before entering the pipes, then pumped through another filtration cage before draining on the beach and being graded into a dune and berm template that was engineered before the first major reconstruction was begun. So far, the 24/7 project has only needed to stop a few times, for a few hours. If bad weather struck, the sailing vessels would seek safe harbor, such as in the Delaware Bay. Costs for the $17.2 million project were split 65/35 between the federal and state governments. Ultimately, officials noted, everyone could save money if the projects weren’t so piecemeal. For instance, when nourishment occurred in late 2017 in Ocean City, Md., the Delaware project had already been announced. These neighboring coastlines are both managed by different offices of the U.S. Army Corps of Engineers (the Baltimore and Philadelphia districts). Congress’s best bet for cost savings would be to treat larger chunks of the Atlantic Coast as one continuous region. “Ad hoc is expensive,” said Carper, top Democrat on the Senate Environment & Public Works Committee. In addition, while the machinery is an interesting view and science project for some people, it also results in a disappointing lack of beach access for others. South Bethany was set to see that inconvenience move their way this week, with beach crossovers closed and pricey vacation homes now next door to heavy machinery. Why did Delaware get stuck with the short end of the straw, with replenishment in the midst of Independence Day? Dredging schedules are constantly being updated, Dast said. Plus, winter work is more likely to suffer weather delays. Dredging is also limited if it could impact animal migration routes. On the positive side, the “soft structure” of an engineered sandy beach makes towns resilient against storms, said Ed Voight, Army Corps spokesperson. But with mounting scientific reports saying the Delaware could be farther and farther underwater by the end of this century, at what point do people stop trying to rescue the sinking landmass? Carper said that, with better environmental controls, such as fuel-efficient vehicles and wind energy, Delaware wouldn’t have to consider more drastic measures. “At the end of the day, the cost to replace businesses would be more” than replenishment, Carper said of the dune protecting homes, expensive businesses and infrastructure. The Bethany/South Bethany and Fenwick Island Coastal Storm Risk Management projects will continue for several weeks in each town, set to conclude by summer’s end.